Members of the community and distinguished guests gathered on October 5th, 2017 to celebrate the groundbreaking ceremony for the Retirement Residence of Glassport. Mayor Rosemary Bradley spoke graciously of her diligent fight to revitalize the long-vacant Glassport Elementary School. The adaptive reuse of the school will consist of 55 one- and two-bedroom units of affordable senior housing awaited by hundreds in the Glassport community. a.m. RODRIGUEZ ASSOCIATES inc.’s President Victor Rodriguez, Allegheny County Executive Rich Fitzgerald, PHFA Executive Director/CEO Brian Hudson, Senator Jim Brewster and Representative William Kortz all praised Mayor Bradley for her efforts and her commitment to the residents of Glassport. Honored guests included Superintendent Rich Fine and The South Allegheny District School Board. Reconstruction of the building began earlier this year at the site on Ohio Ave. Developer a.m. RODRIGUEZ ASSOCIATES inc. was awarded low-income housing tax credits from the Pennsylvania Housing Finance Agency, generating $12.5 million. The balance of funds came from Allegheny County Economic Development, PHFA’s PHARE funds and a deferred developer’s fee. The community awaits the grand opening, scheduled for the summer of 2018. Applications for the Retirement Residence should be available in early 2018. 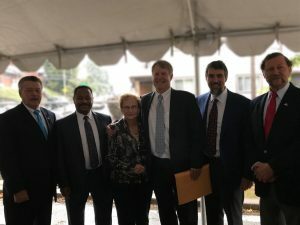 Pictured above left to right: Senator Jim Brewster, PHFA Executive Director Brian Hudson, Glassport’s Mayor Rosemary Bradley, Allegheny County Executive Rich Fitzgerald, Victor Rodriguez, president of a.m. RODRIGUEZ ASSOCIATES inc. Victor Rodriguez and Representative William Kortz.